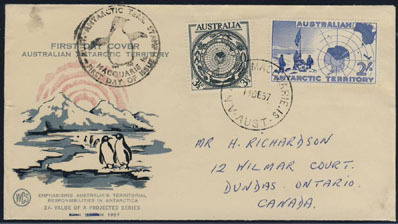 6766 FDC AUSTRALIAN ANTARCTIC TERRITORY (1957) Penguin*. 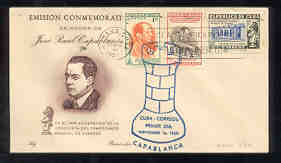 FDC with commemorative cancel & cachet. Scott No L4. 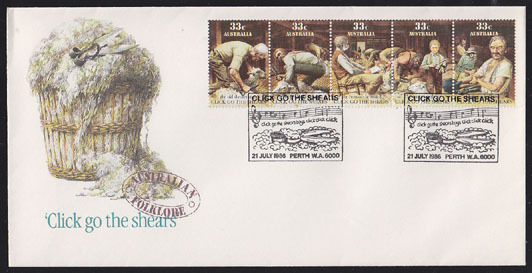 9180 FDC AUSTRALIA (1986) Sheep shearing*. FDC with cachet and thematic cancel of old sheep sheraing song. Scott No 987A. 9241 FDC AUSTRIA (1953) Reconstruction of Lutheran School. 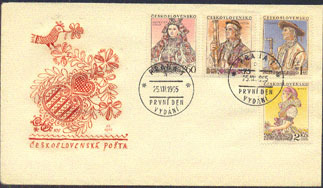 FDC with set of 5 and thematic cancel. Scott Nos B281-5. 18816 FDC AUSTRIA (1959) Cigarette machine*. Tobacco Monopoly Trademark*. Philatelic First Day document consisting of a large engraving of the stamp signed by the artist KLENOFSKY recessed on a card accompanied by an example of the issued stamp with a thematic First Day cancel. Scott No 638, Yvert No 902. 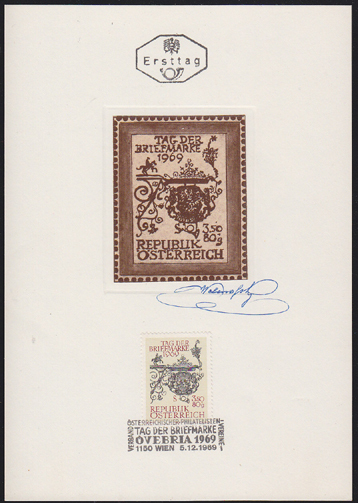 18976 FDC AUSTRIA (1967) Letter carrier*. 16th century playing card*. Philatelic First Day document consisting of a large color hand-drawn image (printed recessed on the document) similar the stamp signed by the artist KLENOFSKY accompanied by an example of the issued stamp with a thematic First Day cancel. Scott No B323, Yvert No 1089. 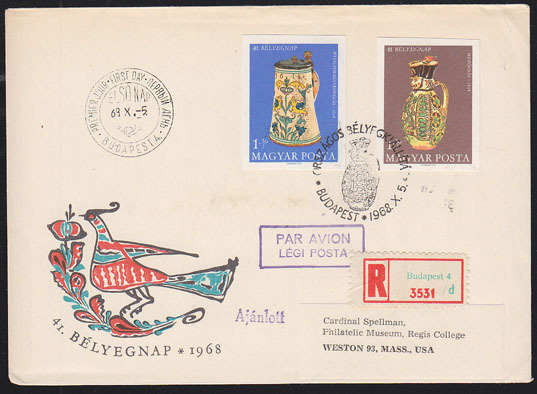 18267 FDC AUSTRIA (1968) Etrich "Dove" Aeroplane*. Philatelic First Day document consisting of a large color hand-drawn image (printed recessed on the document) similar the stamp signed by the artist KLENOFSKY accompanied by an example of the issued stamp with a thematic First Day cancel. Scott No C61, Yvert No PA63. 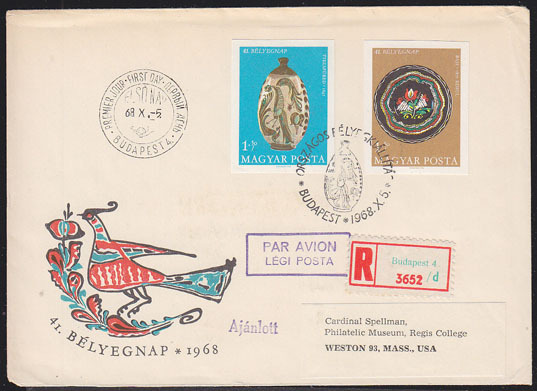 18268 FDC AUSTRIA (1968) Caravelle jetliner*. Philatelic First Day document consisting of a large color hand-drawn image (printed recessed on the document) similar the stamp signed by the artist KLENOFSKY accompanied by an example of the issued stamp with a thematic First Day cancel. Scott No C62, Yvert No PA64. 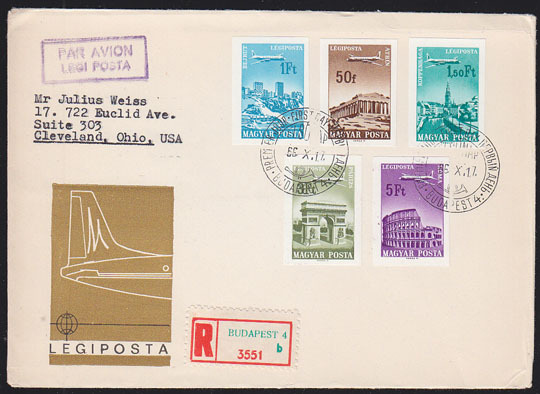 18269 FDC AUSTRIA (1968) Boeing 4-engine jetliner*. Philatelic First Day document consisting of a large color hand-drawn image (printed recessed on the document) similar the stamp signed by the artist KLENOFSKY accompanied by an example of the issued stamp with a thematic First Day cancel. Scott No C63, Yvert No PA65. 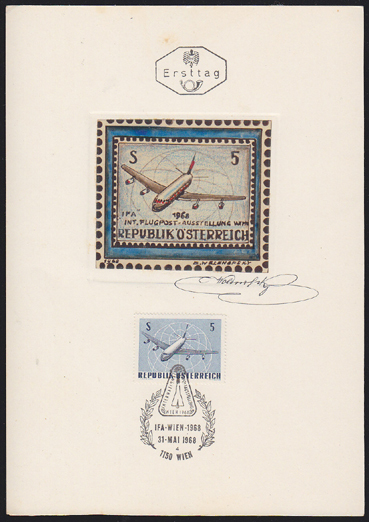 18977 FDC AUSTRIA (1969) Sunken post station sign*. Philatelic First Day document consisting of a large color hand-drawn image (printed recessed on the document) similar the stamp signed by the artist KLENOFSKY accompanied by an example of the issued stamp with a thematic First Day cancel. Scott No B325, Yvert No 1141. 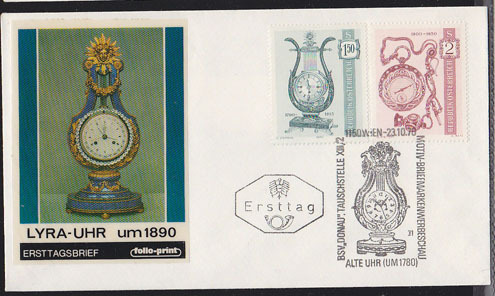 11647 FDC AUSTRIA (1970) Lyre clock*. Pendant clock*. FDC with stuck on label and thematic cancel. Scott Nos 866-7. 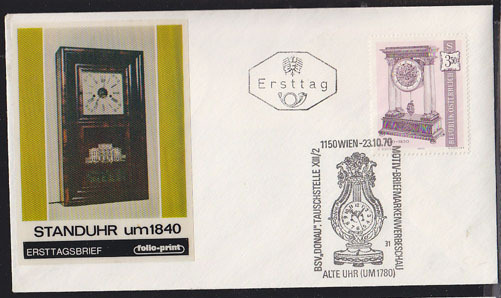 11648 FDC AUSTRIA (1970) Bracket clock*. FDC with stuck on label and thematic cancel. Scott Nos 869. 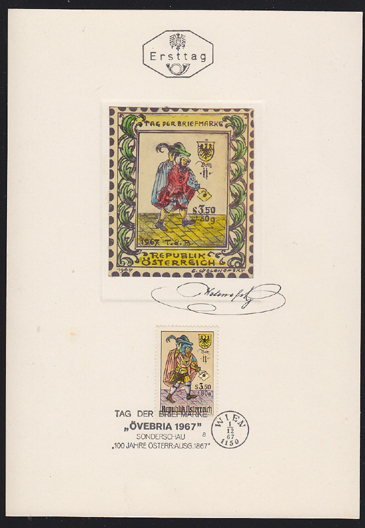 18588 FDC AUSTRIA (1970) Saddlebag, harness & posthorn*. 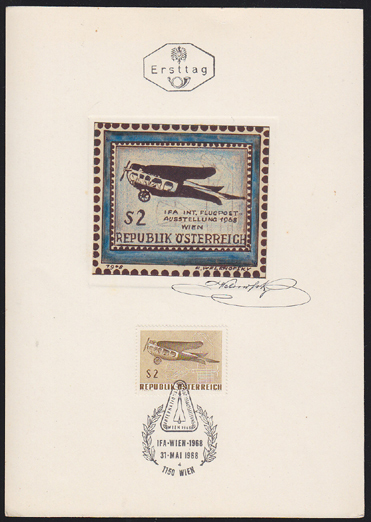 Philatelic First Day document consisting of a large color hand-drawn image (printed recessed on the document) similar the stamp signed by the artist KLENOFSKY accompanied by an example of the issued stamp with a thematic First Day cancel. Scott No B326, Yvert No 1178. 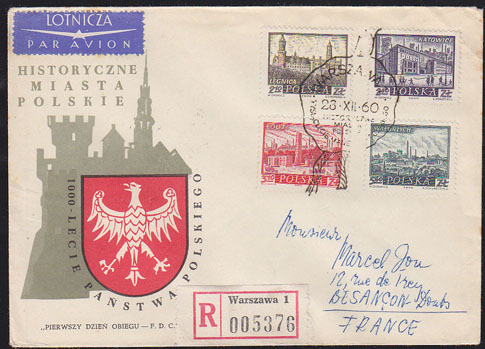 16075 FDC BELGIUM (1951) Relay racers*. 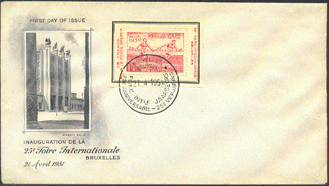 First Day Cover with cachet for 25th anniversary of Brussels Fair. Scott No B482, Yvert No 829. 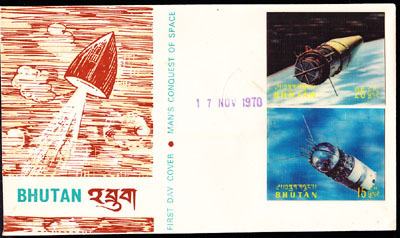 17256 FDC BHUTAN (1970) Jules Verne rocket. V-2 rocket. First Day cover with simulated 3-D stamps and cachet. Scott Nos 118-118a, Yvert Nos 281-2. 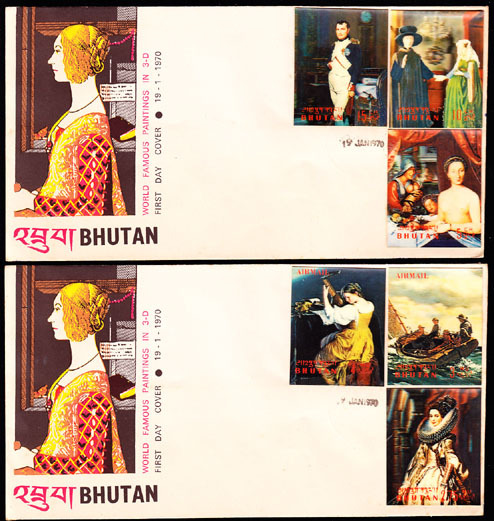 17257 FDC BHUTAN (1970) Vostok. Mariner 2. First Day cover with simulated 3-D stamps and cachet. Scott Nos 118b-118c, Yvert Nos 283-4. 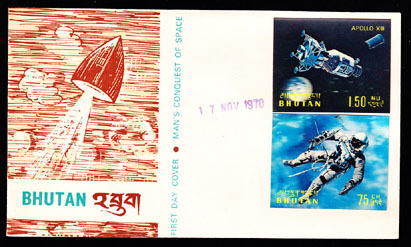 17258 FDC BHUTAN (1970) Apollo XIII. Space walk. First Day cover with simulated 3-D stamps and cachet. Scott Nos 118f-118g, Yvert Nos 287-8. 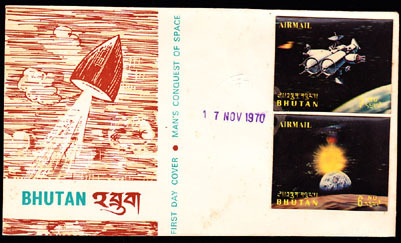 17259 FDC BHUTAN (1970) Planets. Future space station. First Day cover with simulated 3-D stamps and cachet. Scott Nos 118j-118j, Yvert Nos PA80-1. 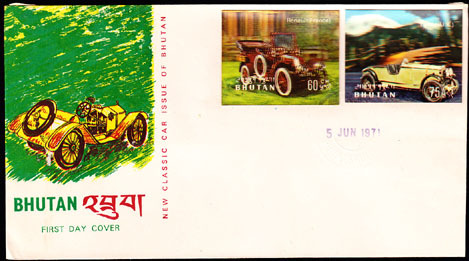 15443 FDC BHUTAN (1971) Antique Mercedes. Ford. First Day cover with simulated 3-D stamps and cachet. Scott Nos 128-128a, Yvert Nos 299-300. 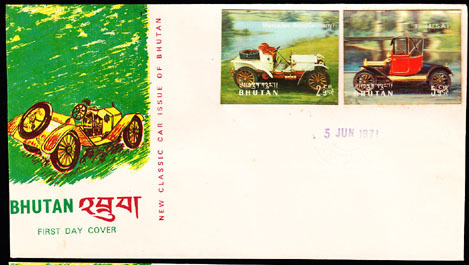 15444 FDC BHUTAN (1971) Antique Alfa-Romeo, Ford. First Day cover with simulated 3-D stamps and cachet. Scott Nos 128b-128c, Yvert Nos 301-2. 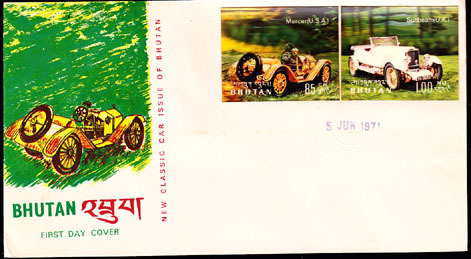 15445 FDC BHUTAN (1971) Antique Hispano-Suiza, Invicta. First Day cover with simulated 3-D stamps and cachet. Scott Nos 128d-128e, Yvert Nos 303-4. 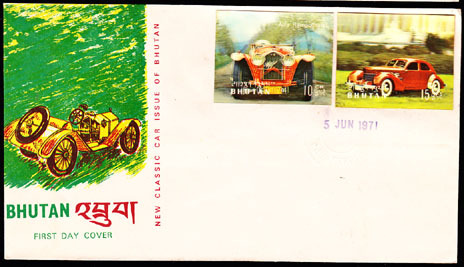 15446 FDC BHUTAN (1971) Antique Renault, Talbot. First Day cover with simulated 3-D stamps and cachet. Scott Nos 128f-128g, Yvert Nos 305-6. 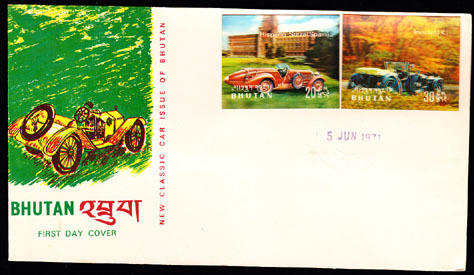 15447 FDC BHUTAN (1971) Antique Mercer, Sunbeam. First Day cover with simulated 3-D stamps and cachet. Scott Nos 128h-128i, Yvert Nos 307-8. 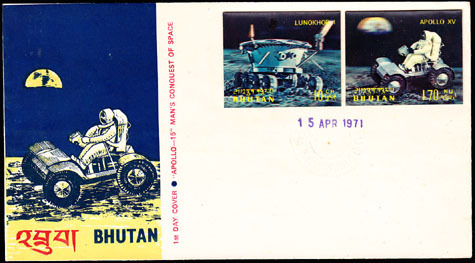 17263 FDC BHUTAN (1971) Lunakhod I. Apollo XV. First Day cover with simulated 3-D stamps and cachet. Scott Nos 127-127a, Yvert Nos 293-4. 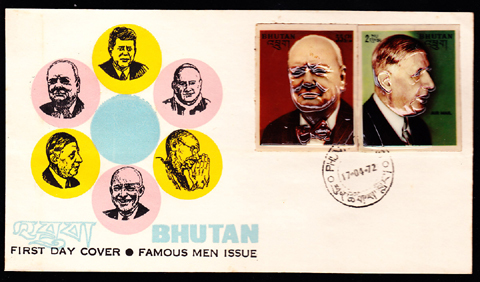 15899 FDC BHUTAN (1972) Churchill. De Gaulle. First Day cover with moulded 3-D stamps and cachet. Scott Nos 145b-145c, Yvert Nos 379-80. 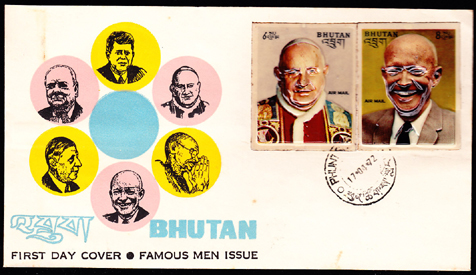 16879 FDC BHUTAN (1972) John XXIII. Eisenhower. First Day cover with moulded 3-D stamps and cachet. Scott Nos 145d-145e, Yvert Nos 381-2. 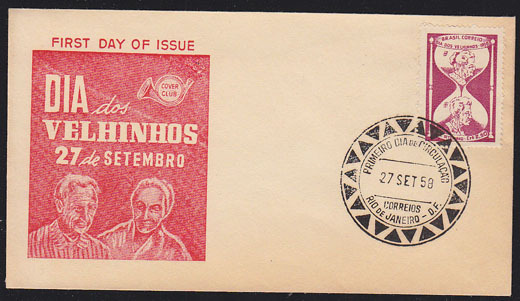 11643 FDC BRAZIL (1958) Hourglass of old people*. 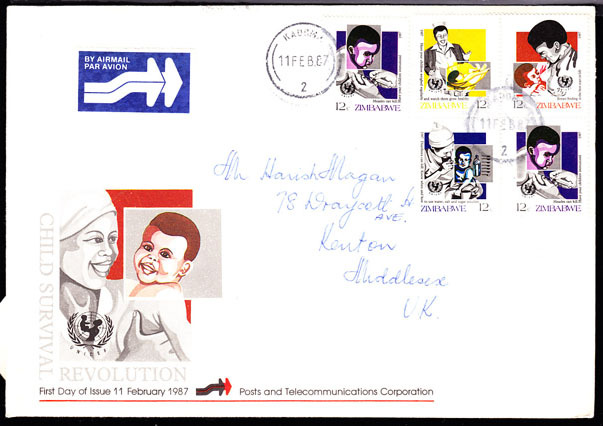 FDC with cachet and special cancel. Old Folks Day. Scott No 881. 3164 FDC CAYMAN ISLANDS (1938) Turtles*. Map of islands*. Dolphin*. Cayman schooner*. 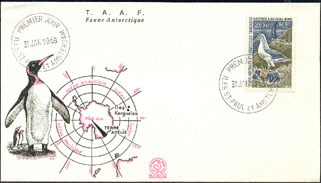 First Day Cover franked with Scott Nos 100-5. Yvert Nos 104-9. 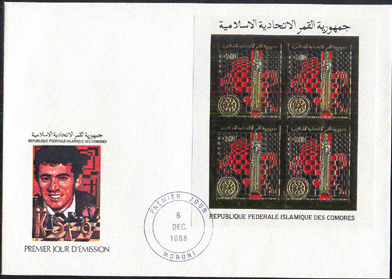 15859 FDC COMOROS (1988) Chessboard*. Queen*. Rotary emblem*. First Day cover franked with imperforate bl/4 gold foil minisheet and cachet of Garry Kasparov. Scott No 676, Yvert No 267. 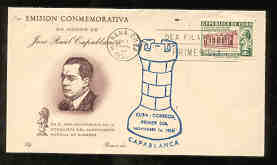 7819 FDC CUBA (1942) Ignacio Loynaz*. Rescue of Sanguily*. Set of 2 FDCs franked with cross-gutter blocks of 4 and special cancel. Scott Nos 373-4, Yvert Nos 274-5. 7026 FDC CZECHOSLOVAKIA (1955) Regional costumes*. 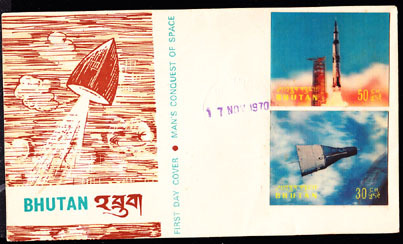 Set of 4 stamps on First Day Cover. Scott Nos 707-10, Yvert Nos 816-9. 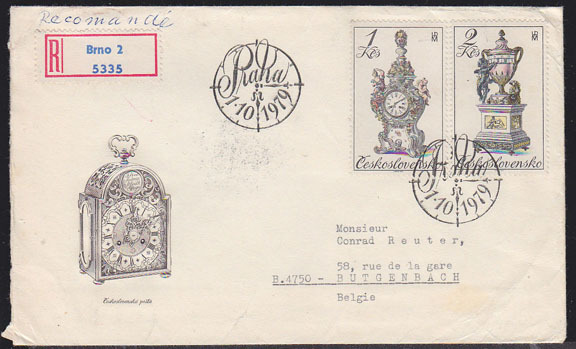 11651 FDC CZECHOSLOVAKIA (1979) 18th century clocks*. FDC with cachet and First Day cancel. 6779 FDC FRANCE (1966) Oléron Viaduct*. 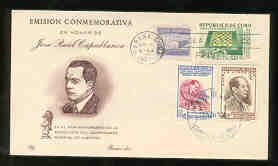 First Day Cover with commemorative cancel. Scott No 1162, Yvert No 1489. 6629 FDC F.S.A.T. (1968) Black-browed albatross*. Unaddressed FDC with cachet. Scott No 28, Yvert No 24. Dallay catalog 475 euros. Scott catalog for the stamp is $400. 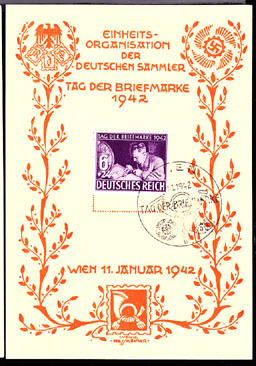 2598 FDC GERMANY (1941) Postillion*. First Day postcard franked with Scott No B188. Special cancel and cachet by Meerwald. 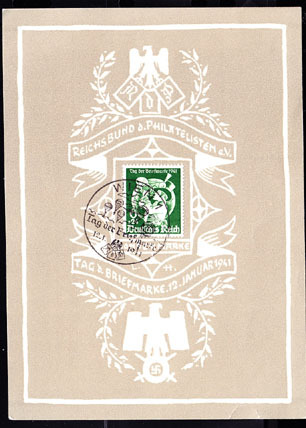 2599 FDC GERMANY (1941) Postillion*. First Day postcard franked with Scott No B188. 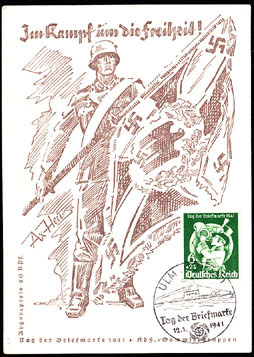 Special cancel and cachet of soldier carrying flag by Axter-Heudtlass. 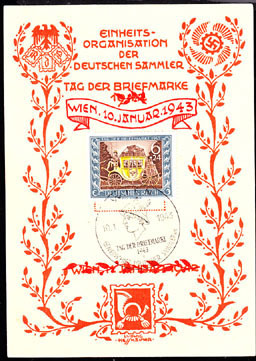 2600 FDC GERMANY (1941) Postillion*. First Day postcard franked with Scott No B188. Special cancel and cachet by Ludwig Hesshaimer. 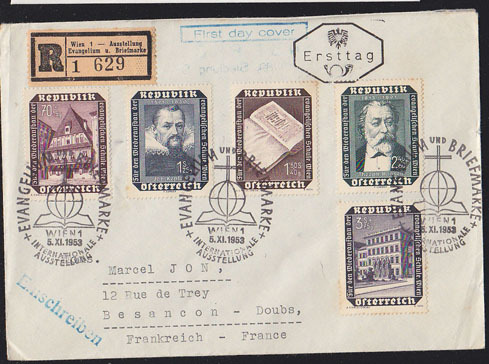 2601 FDC GERMANY (1942) Philatelist*. First Day postcard franked with Scott No B201. 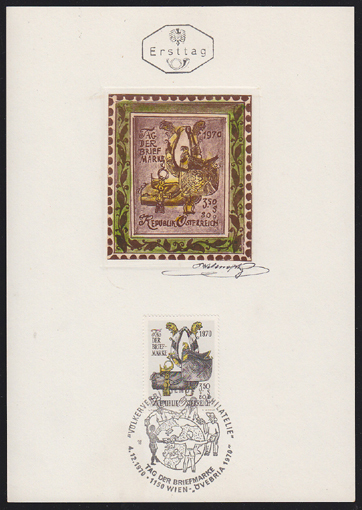 Special cancel and cachet by Ludwig Hesshaimer. 2602 FDC GERMANY (1942) Philatelist*. First Day postcard franked with Scott No B201. Special cancel and cachet by Ludwig Hesshaimer. 2603 FDC GERMANY (1942) Philatelist*. First Day postcard franked with Scott No B201. 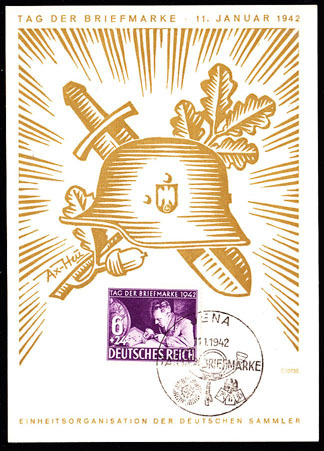 Special cancel and cachet of soldier's helmet by Axter-Heudtlass. 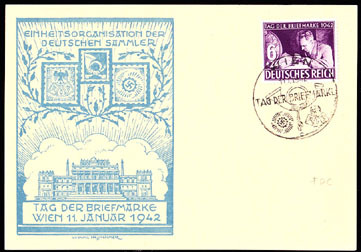 2604 FDC GERMANY (1943) Carriage*. First Day postcard franked with Scott No B215. Special cancel and cachet by Ludwig Hesshaimer. 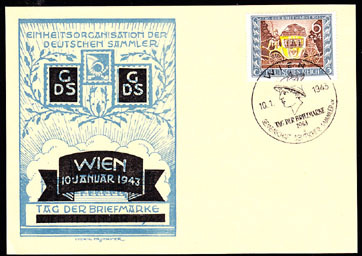 2605 FDC GERMANY (1943) Carriage*. First Day postcard franked with Scott No B215. 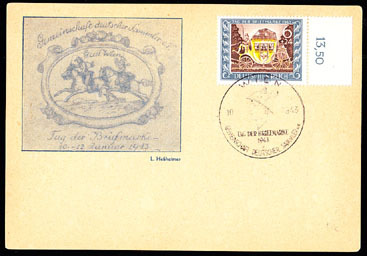 Special cancel and cachet of horse postmen by Ludwig Hesshaimer. 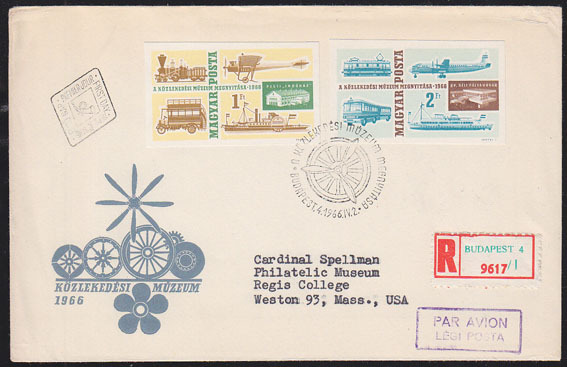 2606 FDC GERMANY (1943) Carriage*. First Day postcard franked with Scott No B215. Special cancel and cachet by Ludwig Hesshaimer. 6780 FDC GREAT BRITAIN (1968) Bridges*. 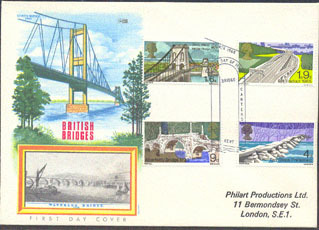 FDC with set of 4 stamps depicting British bridges. Scott Nos 560-3, Yvert Nos 506-9. 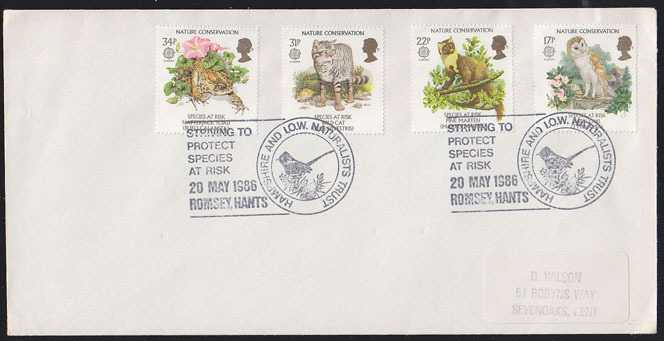 9990 FDC GREAT BRITAIN (1986) Nature conservation - species at risk. FDC with cachet and special cancel. Scott Nos 1141-4. 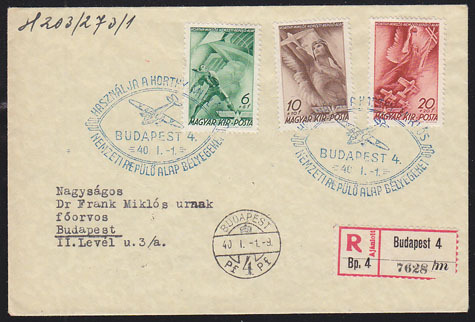 15482 FDC HUNGARY (1940) Boy flying kite*. Angels flying planes*. 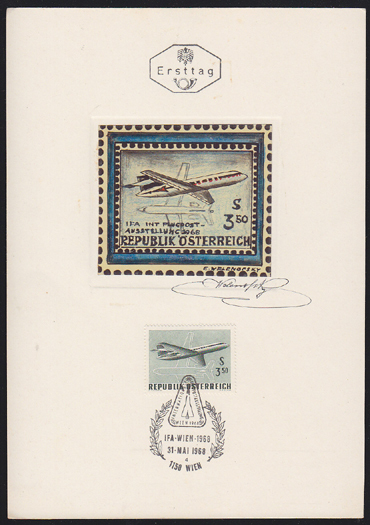 Registered FDC with Horthy Aviation Fund illustrated cancel. Scott Nos B110-2. 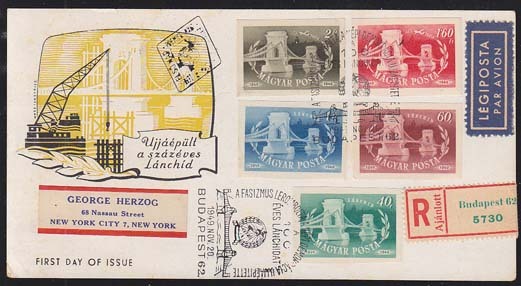 651 FDC HUNGARY (1949) Chain bridge*. Complete set of 5 imperforates on registered cacheted FDC. Scott 861-3,C64-5. 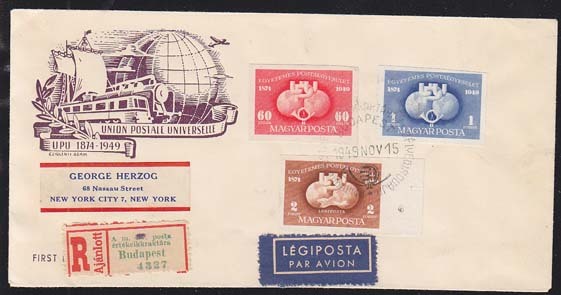 2806 FDC HUNGARY (1949) Symbols of UPU*. 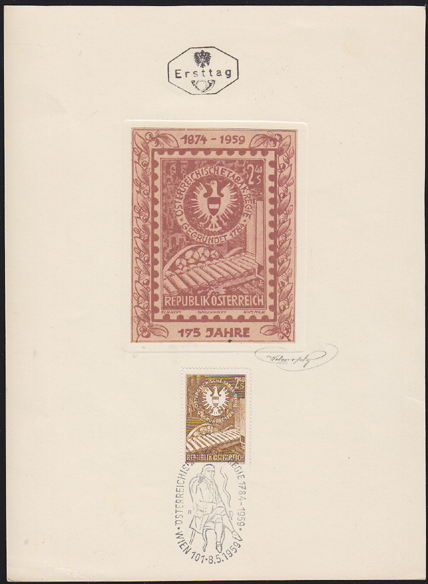 Complete set of 3 imperforates on registered cacheted FDC. Scott 859-60,C63. 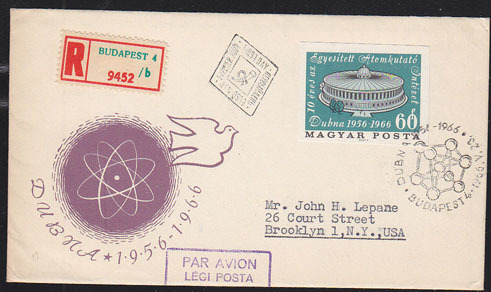 15380 FDC HUNGARY (1966) Dubna Nuclear Research Institute. Registered letter franked with imperforate. Scott No 1763, Yvert No 1829. 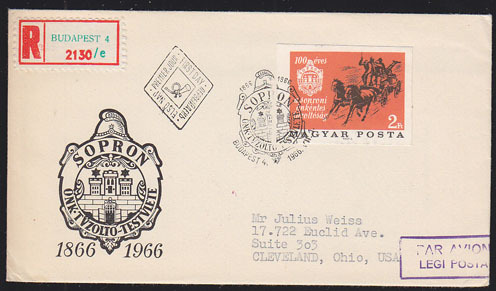 16103 FDC HUNGARY (1966) Horse-drawn fire pump. Registered letter franked with imperforate. Scott No 1768, Yvert No 1863. 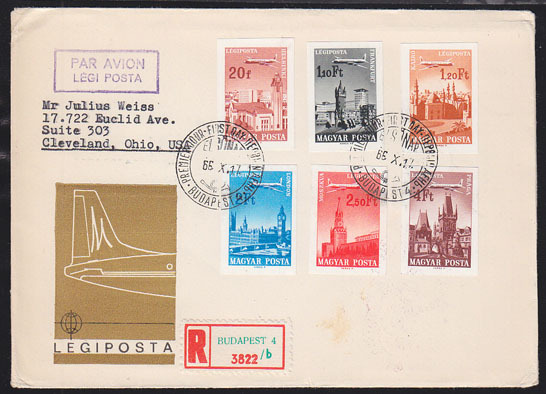 17652 FDC HUNGARY (1966) Transport museum. 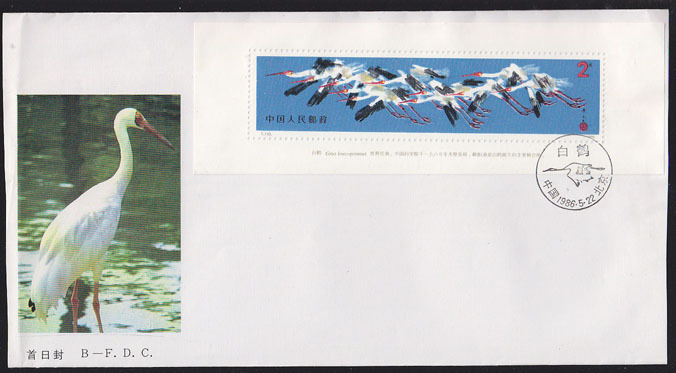 Registered letter franked with set of 2 imperforates. Scott Nos 1752-3, Yvert Nos 1824-5. 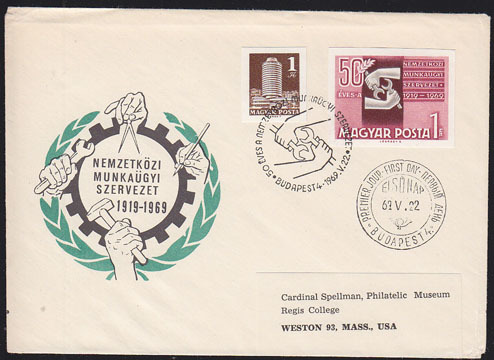 16420 FDC HUNGARY (1969) ILO emblem. Registered letter franked with imperforate. Scott No 1974. 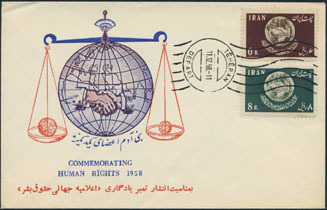 17789 FDC IRAN (1958) Handshake*. 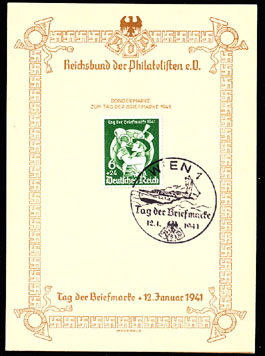 First Day Cover with commemorative cachet. Scott Nos 1128-9, Yvert Nos 933-4. 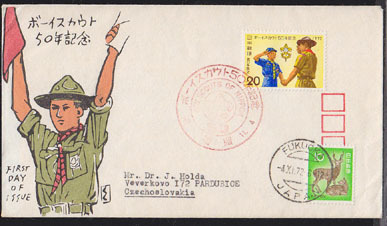 11156 FDC JAPAN (1972) Scout holding flags*. Hand-made First Day Cover with official cancelation. Scott No 1130, Yvert No 1069. 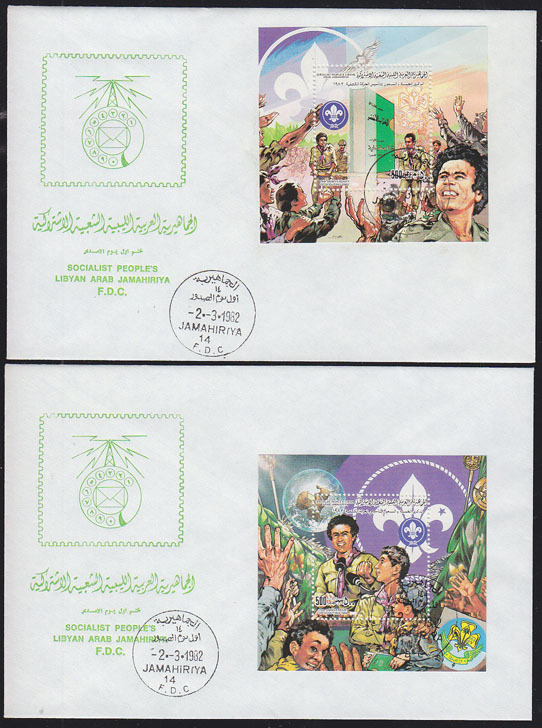 17151 FDC LIBYA (1982) Scouting 75th anniversary*. Set of 2 unaddressed FDCs with cachet. Scott Nos 1102-3, Yvert Nos BF50-1. 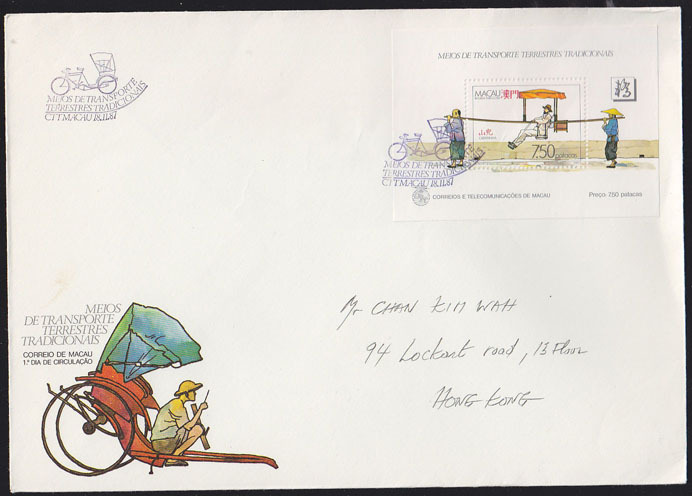 9489 FDC MACAO (1987) Sedan chair. 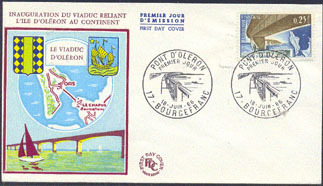 FDC with cachet and special cancel for modes of transportation. Scott No 559. 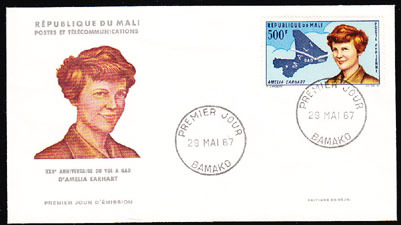 3443 FDC MALI (1967) Amelia Earhart*. 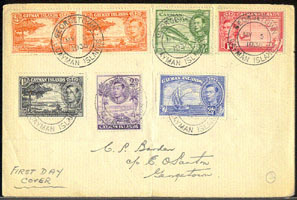 First Day cover with cachet of Earhart. Scott No C45, Yvert No PA45. 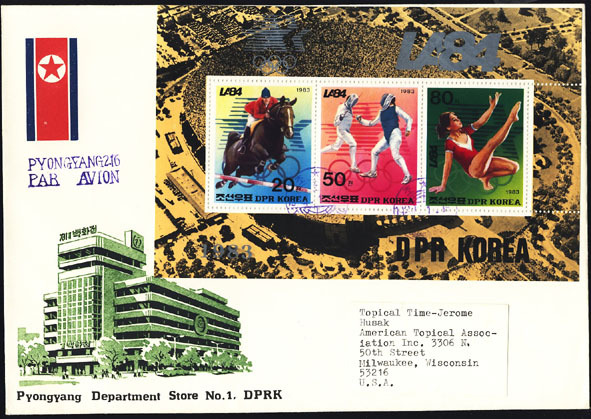 7457 FDC NORTH KOREA (1983) Jumping*. Fencing*. Gymnast*. First Day cover franked with Los Angeles Olympics souvenir sheet. Michel Block 163A. 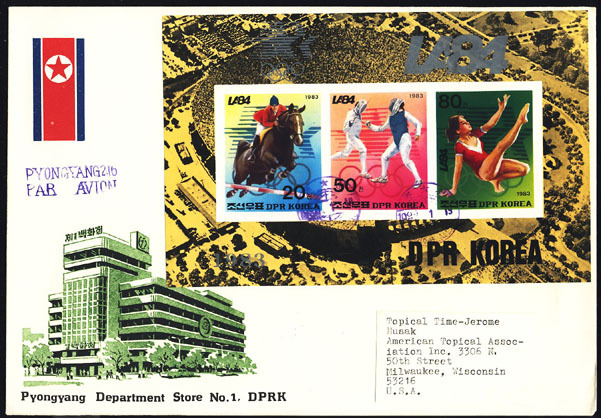 7458 FDC NORTH KOREA (1983) Jumping*. Fencing*. Gymnast*. First Day cover franked with Los Angeles Olympics imperforate souvenir sheet. Michel Block 163B. 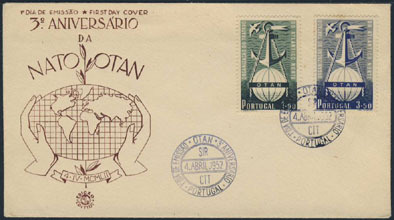 2826 FDC PORTUGAL (1952) Anchor*. NATO*. First Day Cover with cachet. Scott Nos 747-8, Yvert Nos 760-1. NATO 3rd anniversary. 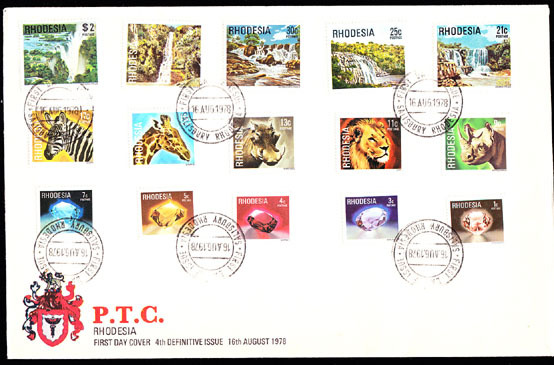 16036 FDC RHODESIA & NYASALAND (1960) Kariba power station inauguration. Registered FDC addressed to Southern Rhodesia. Scott Nos 172-7. 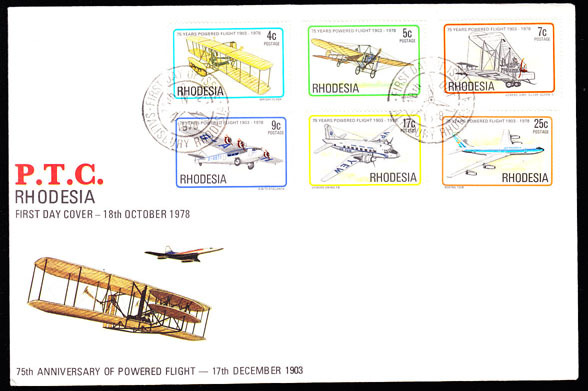 15487 FDC RHODESIA & NYASALAND (1962) Rhodesia-London airmail service. Registered FDC addressed to Southern Rhodesia. Scott Nos 180-2. 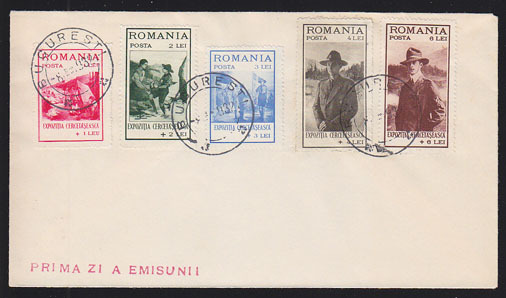 17020 FDC ROMANIA (1931) Scouting activities. Unaddressed FDC franked with set of 5. Scott Nos B26-30. 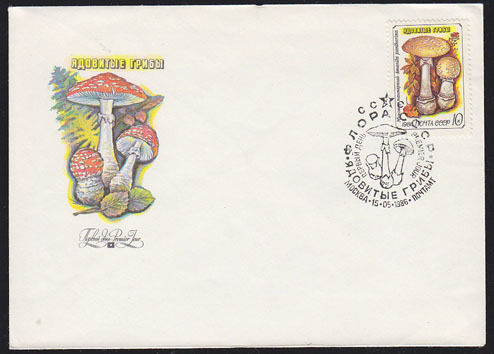 10766 FDC RUSSIA (1986) Panther cap (Amanita pantherina)*. FDC with cachet and special cancel. 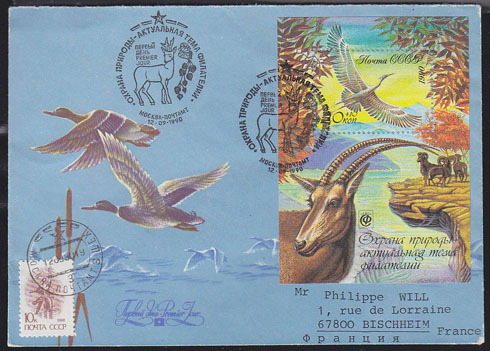 9991 FDC RUSSIA (1990) Nature conservation. 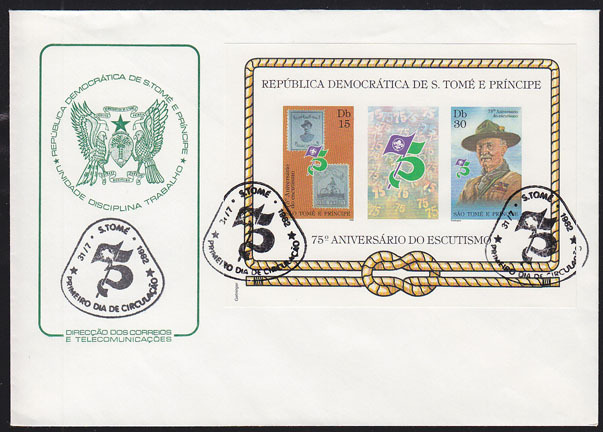 FDC of S/S with full-envelope cachet and special cancel. Scott No B172. 4290 FDC SERBIA (1942) Anti-Masonic propaganda. 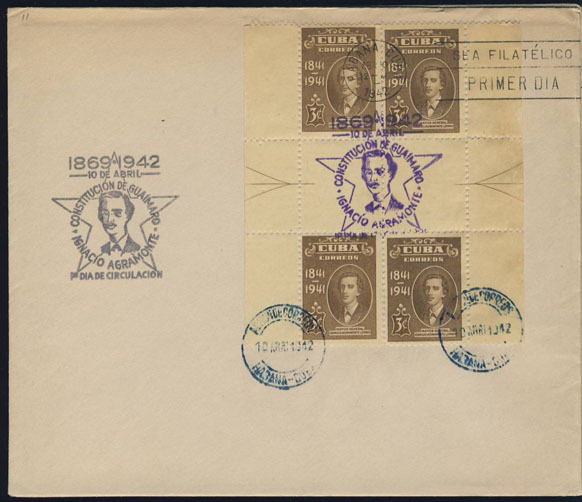 Set of 4 semi-postals on FDC all tied by First Day Beograd cancel. Anti-Masonic Exposition of October 22, 1941. Scott Nos 2NB15-18. Not easy to find! 17148 FDC ST. THOMAS & PRINCE (1982) Early COGH stamps*. Baden-Powell*. Unaddressed FDC franked with imperf S/S. Scott Nos 658-9. 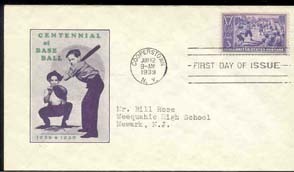 11339 FDC U.S.A. (1939a5) Sandlot Baseball Game*. Children*. Scott No 838. Yvert No 407. The very popular issue commemorating the Baseball Centennial. 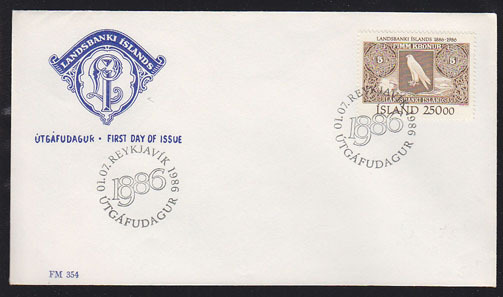 First Day Cover on addressed envelope. Violet and green Ioor cachet (Planty No52B) showing children playing. Scarce! 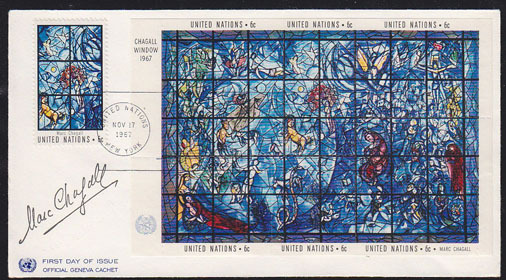 9376 FDC UNITED NATIONS (1967) Stained glass window*. FDC signed by the artist Marc Chagall. Scott Nos179-80. 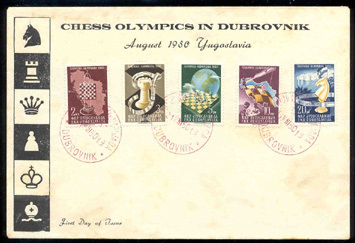 15856 FDC YUGOSLAVIA (1950) Dubrovnik Chess Olympics. Scott No 300-4. Yvert No 549-553. 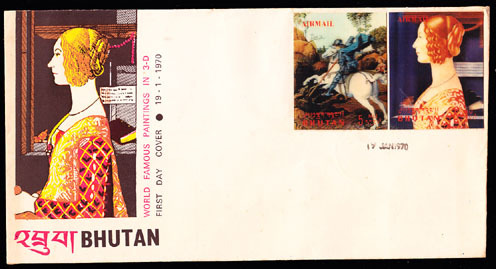 Second Day Cover on illustrated envelope. Red Cancel from the Olympic site. Some staining. 15887 FDC ZIMBABWE (1987) UN child survival program. FDC addressed to the UK. 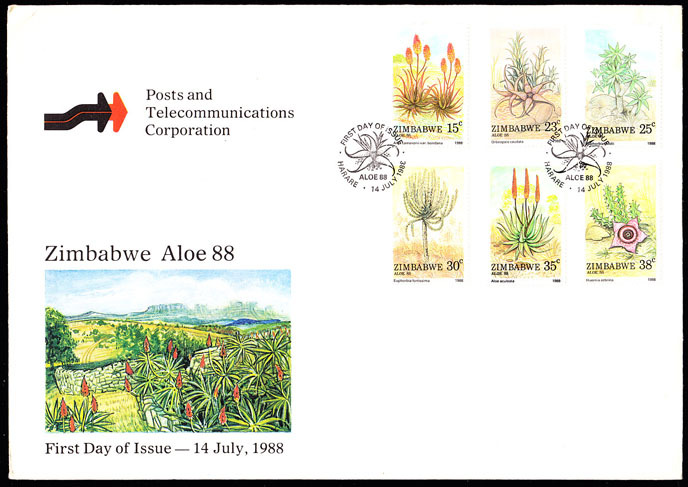 Scott Nos 541a-d.
16834 FDC ZIMBABWE (1988) Aloes and succulents. Official FDC with cachet. Scott Nos 566-71. 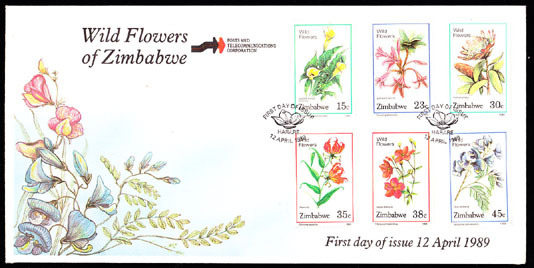 16236 FDC ZIMBABWE (1989) Wild flowers of Zimbabwe. Official FDC with cachet. Scott Nos 582-7.